The mobile automation is becoming trending topic these days. There are new tools introducing in the market in order to make the iOS and Android automation hassle free and Appium is one of them. In this tutorial, we will see how to setup Mac OSX for iOS automation using BDD tool [Cucumber], cloud testing service Saucelabs and Appium server. It’s very easy to setup and on different platform. You can read more about Appium on Appium-Github page. There is a nice blog post to setup Mac OXS with Ruby-ish tools [ Moncef’s blog.] Basically, you need to install following tools and services. Please follow the steps in the @monfresh ‘s blog and you will have the above tools installed in your Mac OSX. On top of that you need to install few other tools. This will install node.js package management system. 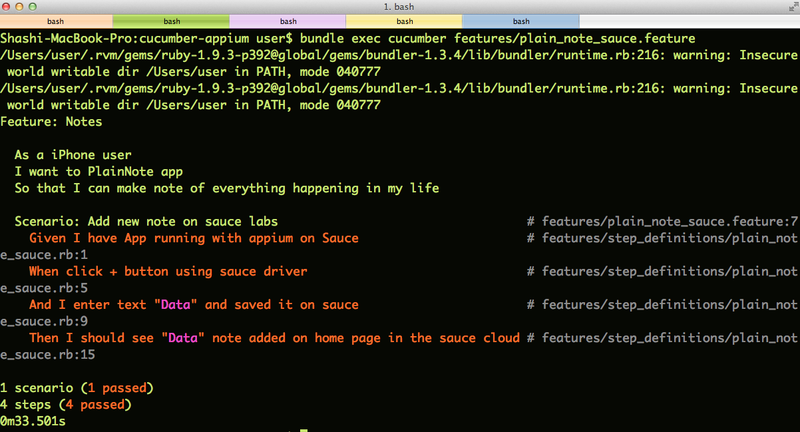 You can follow steps in appium-ruby-console-osx to get everything setup for you. If you are on Mac OSX, I would strongly recommend to download Appium dmg. 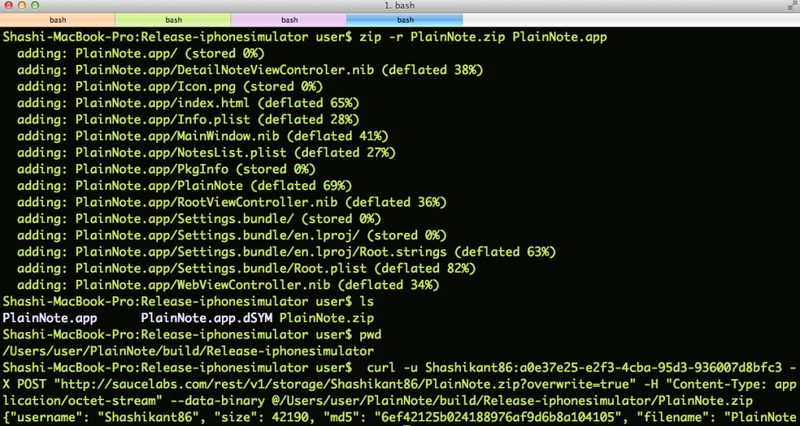 This creates a “build/Release-iphonesimulator” directory in your Xcode project that contains the “PlainNote.app” package that you’ll need to communicate with the Appium server. 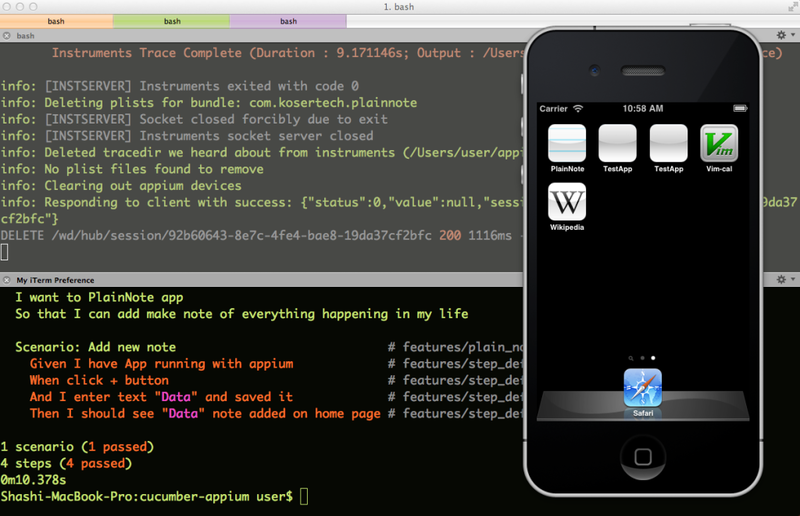 Appium App on OSX is very handy to record and playback tests for your iOS app. You can launch ‘Appium Inspector’ by clicking on ‘i’ icon. 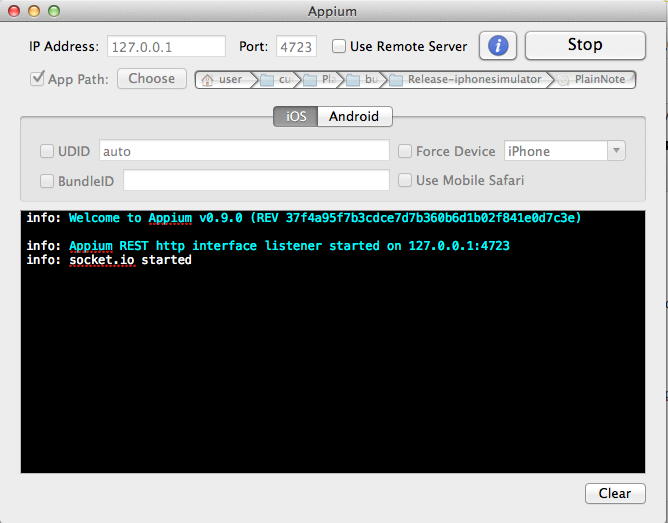 Appium Inspector can find elements and perform actions on it. You can record and playback tests using Ruby, Python, Java, node etc etc. source "https://www.rubygems.org" gem "rest-client" gem "rspec" gem "selenium-webdriver" gem "cucumber" gem "rspec-expectations"
This will create ‘Gemfile.lock’ file. Now, we will write a feature file using Given When Then format. The feature file is written using Gherkin Domain Specific Language. This feature is self explanatory, we are going to add new note and make sure it displayed on Home page. Let’s create ‘features/support/env.rb‘ where we can put our support code. Insert following code in the file. You will see all the steps passed. Saucelabs is a cloud testing framework which allow us to setup cross-browser, cross-platform and cross-device tests in the cloud. Saucelabs [@saucelabs] recently announced appium support which makes it easier to test Mobile apps in the cloud. You need to have saucelabs account in order to use it if not you can sign up for free account. Note: I have used my Saucelabs details for this tutorial, you can try with your own. In order to test PlainNote App on Saucelabs, we need to do some initial setup. In order to compile PlainNote App with sauce, we need to checkout an app to the different location. In Sauce, TARGETED_DEVICE_FAMILY parameter had different values e.g 1 is for iPhone, 2 is for iPad and 1,2 is for universal apps. 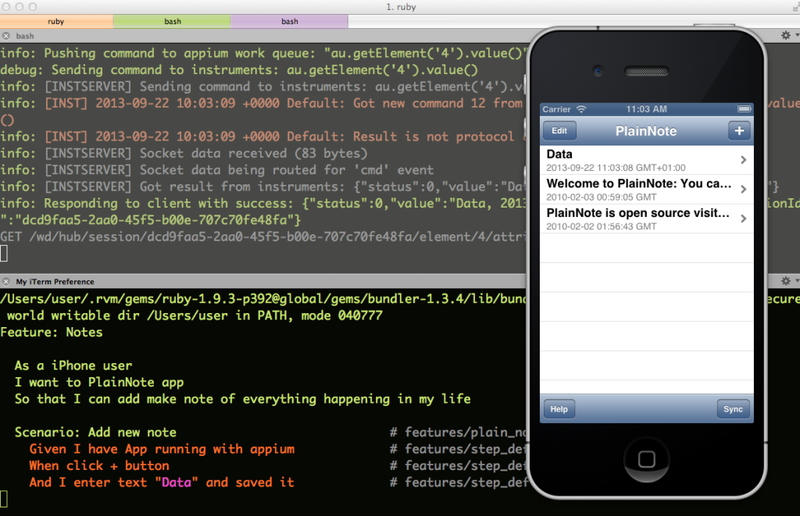 Now, once build is successful, it will create “PlaneNote.app” at ‘/build/Release-iphonesimulator‘. Note: I have committed “PlainNote.zip” file to GitHub , so that you can use it directly to upload it to SauceLabs. and you will see Tests running on the SauceLabs. Once everything done. The source-code of the demo is available on GitHub Cucumber-Appium. You can try it yourself. Then you can run sauce feature with Appium. Mobile testing framework Appium can be used for iOS automation with BDD tool like Cucumber and cloud testing services SauceLabs. Happy BDD !